Designing new dairy housing provides the opportunity to look at things differently – but when there are students involved it adds an extra layer of complexity. Outdated farm buildings can hamper productivity, impinge on cow welfare and be difficult to manage. So when the time comes to replace them, it is a rare opportunity to adopt new technology and design features to make the whole system more efficient and easier to manage. That is exactly what happened at the College of Agriculture, Food and Rural Enterprise in Northern Ireland, which – with the help of funding from the then Department of Agriculture and Rural Development – recently replaced its dairy housing and maternity wing. As both a working farm and student training facility, it had to be both cutting-edge and practical. So how did the team go about designing such a facility? The most important element, according to senior dairy technologist Martin Mulholland, was to consult other farmers and to visit farms and research centres around the world. Each person was given a separate area of responsibility, from the milking parlour and cow flow to cubicle design and ventilation. 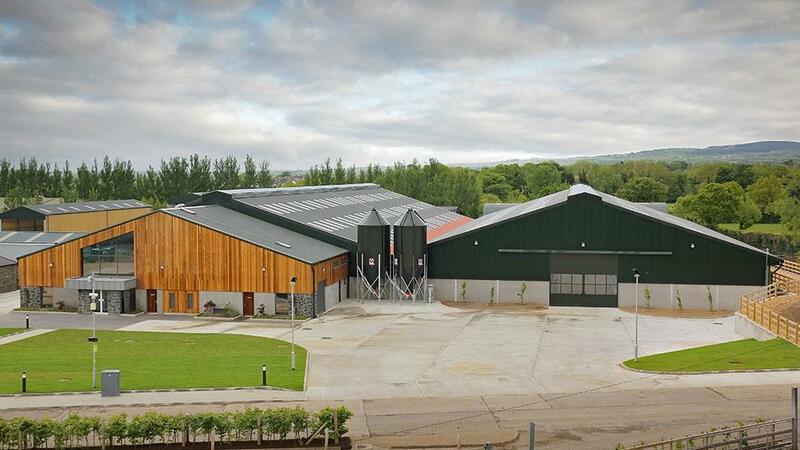 One difficulty was the new building had to sit alongside the existing parlour building, which would hamper air flow. So, with the help of Jamie Robertson, an honorary research fellow at Aberdeen University, the team decided to raise the roof by one metre to aid ventilation. The building has a covered centre ridge opening, with an open side away from the prevailing wind which is fitted with automatic ventilation curtains, operated by an on-site weather station. The new house was designed for 150 cows, with 178 cubicles bedded with mattresses and sawdust. After extensive research into different cubicle designs, Mr Mulholland opted for a design with no horizontal bars at lunging height to help cows stand and lie down easily. The slurry system comprises two small deep tanks within the building, fed by slurry channels and automatic scrapers, then pumped out to an above-ground slurry store. “We wanted to minimise the risk of slurry gas in the building and allow fresh slurry to be used for anaerobic digestion in the future,” he says. The floor surfaces were designed in Holland to reduce ammonia emissions. The grooves run the length of the house and are scraped by finger scrapers every two hours. “Reducing ammonia is a big issue in Northern Ireland,” says Mr Mulholland. The shed was stocked in June 2013, so how has it worked out? “Production has certainly risen. Before we moved in the cows were yielding 7,200 litres a year, and now they are averaging 8,700 litres,” he says. Cows graze from mid-March until mid-November and calve from September until April, with autumn calvers grazing from early spring then housed for winter after calving. Having designed the shed around labour requirement, it has made many jobs simpler, he says. The cows can be kept in up to four different groups, with passages leading them directly to the parlour and back to their respective part of the building. One aspect of student training is clipping the cows. This used to rely on mobile crates which had to be brought up from the bottom of the yard, erected and bolted down. There is also a 3.5-metre-long foot bath at the exit from the milking parlour, which is filled with a copper sulphate solution once-a-week to keep the cows’ hooves in good condition. Having erected the new cubicle building, the farm went on to create new dry cow and heifer housing, with increased focus on cow comfort. 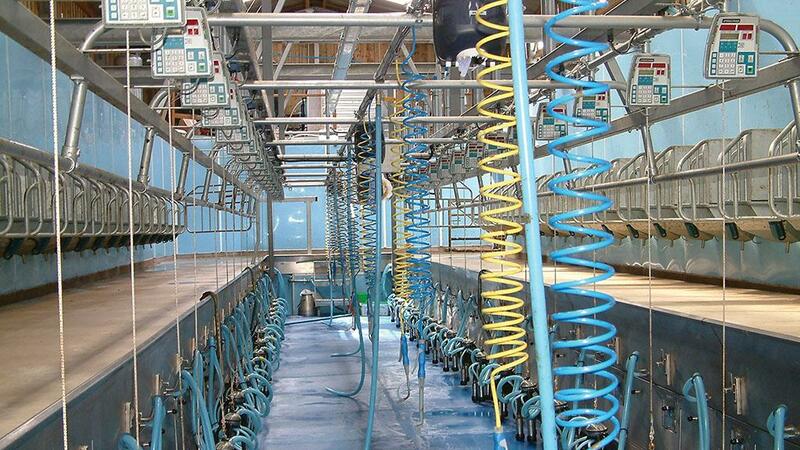 These are built to the same spec as the milking shed, but with 100mm wider cubicles in the dry cow house. The heifer house has locking yokes for artificial insemination, whereas the main milking herd is inseminated in the crush. “We have a stock bull for sweeping up, and a safe handling pen located at the exit of the milking parlour to keep him stimulated,” says Mr Mulholland. It features sturdy gates to make it safe to clean out, and a locking yoke to restrain cows for service. The maternity wing has straw-bedded calving pens, on which cows are housed for five to seven days both pre- and post-calving, with an individual pen for calving. Importantly, the pens are laid out in four rows of three pens. “Once we have used three pens we can clean them out through the roller doors to the outside, and disinfect them easily,” says Mr Mulholland. This has reduced the incidence of sole ulcers and lameness, and has also helped older cows as well. Each calving pen has calving gates should the cow need to be restrained, and there is a portable 240v milking machine which is used to milk the cow and provide colostrum for tube feeding the calf within the first hour. 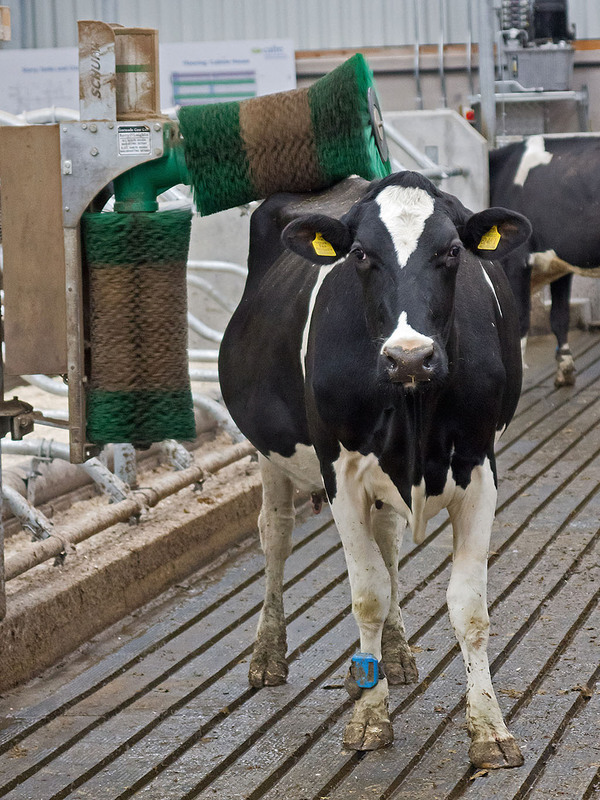 The cows are milked twice a day in the 20-a-side double herringbone parlour, with automatic identification used to generate automatic feeding and milk recording. The cows each have a pedometer and are fed a total mixed ration, grouped according to yield and stage of lactation. “We feed a base ration, topped up to yield in the parlour to keep things easy and avoid wasting food on the low yielders,” says Mr Mulholland. Robotic scrapers clean the collecting yard and movement passages after each milking, and the cows have four motorised brushes for grooming, which are well used. Five years down the line, is there anything that Mr Mulholland would have changed? “We have made one or two little modifications – the roller blinds came down to calving pen height but there was too much draught so we brought them down to the floor,” he explains. The next phase of the development is to build new calf rearing facilities with automatic feeders and covered igloo housing, which should be completed next year. So with all this experience behind him, what advice would Mr Mulholland offer to other farmers who are considering erecting a new building? “Go and look at loads of good units and always ask the person who is working there what they would do differently,” he says.